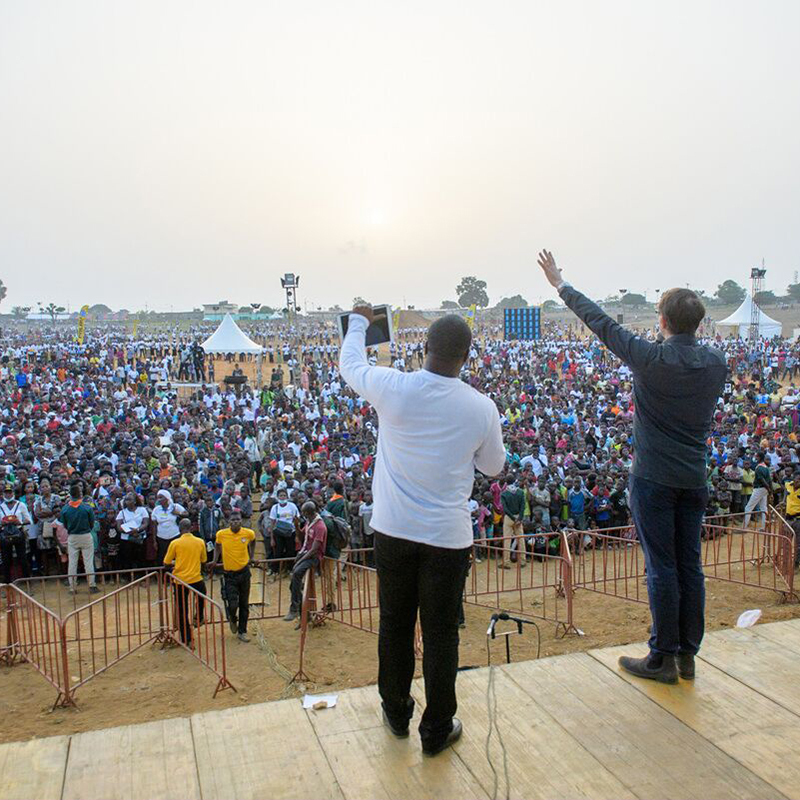 At the February 15-17 festival in Abidjan, more than 19,000 individuals made a decision for Jesus or a recommitment to a life with Him, reported the Luis Palau Association. The three-day festival was the culmination of the Love Côte d’Ivoire campaign in the capital city. In addition to the festival, the Palau team worked throughout the week in partnership with more than 2,200 local churches to coordinate multiple programs to bless the community of Abidjan, including the following outreaches: reading eyeglass clinics, medical clinics, sports clinics, outreaches for children, events at schools, an outreach at the nation’s largest prison, and dinners for women and business leaders. For the past three years, the Luis Palau Association and several partner ministries have been working with church leaders in Côte d’Ivoire in an effort to proclaim the life-changing message of Jesus, unite the Church, and impact the entire nation with the Gospel. Originally invited by 400 local churches, Palau, son of evangelist Luis Palau, first focused his attention on the city of Yamoussoukro last year, where most of the church partners were based. But the vision quickly grew as more churches joined in the effort – expanding into the cities of San Pedro and then Abidjan. In addition to the more than 2,200 partnering churches from throughout Côte d'Ivoire, several business and civic leaders stepped in to help bring the campaign to Abidjan. For more information about the Palau Association and this campaign in Côte d’Ivoire, visit www.palau.org. The Love Côte d’Ivoire Festival marks the Palau team’s tenth capital city campaign on the continent. Others have been organized in Lilongwe, Malawi (2016); Addis Ababa, Ethiopia (2013); Dar es Salaam, Tanzania (2012); Kigali, Rwanda (2009); and Cairo, Egypt (2008).